Bacteria of the genus Arthrobacter are considered to be ubiquitous in soil. They are highly resistant to desiccation and nutrient depletion, and utilize a wide and varied range of natural as well as xenobiotic compounds (Cac-ciari and Lippi 1987). A number of catabolic traits of Arthrobacter strains are encoded on plasmids. A well-known example is the circular, 165-kb plasmid pAO1 of A. nicotinovorans, which contains the genes coding for l-nicotine catabolism (Brandsch and Decker 1984; Igloi and Brandsch 2003). Other (presumably circular) catabolic plasmids of different Arthrobacter spp. code for the degradation of 2-nitroaromatic compounds (Chauhan et al. 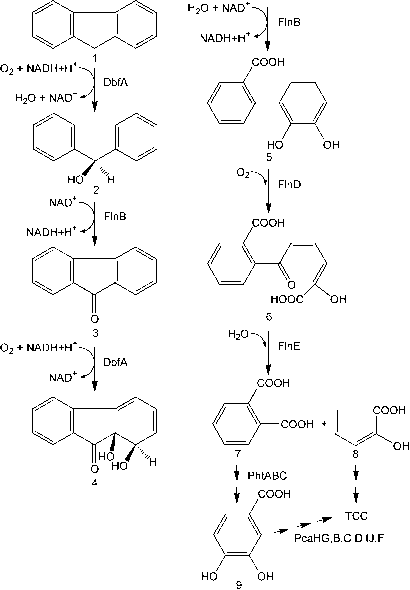 2000; Chauhan and Jain 2000), phthalate (Eaton 2001), phenylurea herbicides (Turnbull et al. 2001), carbaryl and 1-naphthol (Hayatsu et al. 1999), S-ethyl-N,N-dipropylthiocarbamate (Tam et al. 1987), pyridine, dimethylpyridine and hydroxypyridine (Weinberger and Kolenbrander 1979; Agapova et al. 1992), and atrazine (Sajjaphan et al. 2004).